White short-sleeved shirt, with a rectangular panel of horizontal shadow pin-stripes across the chest. Upper and lower edges bounded by an outer thin stripe and an inner thick stripe. Centre of panel contains eight thin stripes bounded by a thick stripe at the top and bottom. Two navy blue stripes around crew-neck collar and cuffs. Repeating pattern of two shadow concentric diamonds, bounded by two shadow stripes at each side, running from the neck to the cuffs on a raised panel, down each shoulder and outer sleeve. Microfibre breathable panel down each side of shirt covering underarm and inner sleeve. Embroidered emblem on left breast, with 'ENGLAND' in capitalised white lettering inside a navy blue panel above the emblem. Two embroidered navy blue concentric diamonds on right breast, with 'UMBRO' in capitalised navy blue lettering underneath and a registered trademark placed above the gap between the 'R' and the 'O' in navy blue. Red number on reverse and in centre of chest over upper two-thirds of shadow chest stripe panel, in a new font. Navy blue shorts, with navy blue drawstring. Repeating pattern of two shadow concentric diamonds, bounded by two shadow stripes at each side, running down a raised panel on each seam, including the waistband. 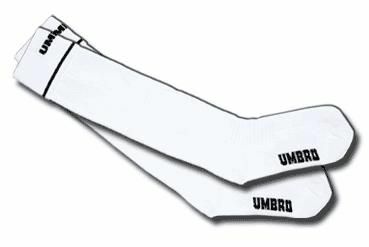 Two embroidered white concentric diamonds on left thigh, with 'UMBRO' in capitalised white lettering underneath and a registered trademark placed above the gap between the 'R' and the 'O' in white. 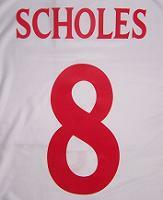 White number, in the same font as on the shirt, above the Umbro logo on left thigh. Embroidered emblem on right thigh, with 'ENGLAND' in capitalised white lettering inside a navy blue panel above the emblem. White socks. 'UMBRO' in large capitalised navy blue lettering across turnovers edged with navy blue hoop and along right side of footing. A long-sleeved version of the shirt was also worn. The cuffs were navy blue, with a white stripe near the edge. For the two games played in the 2000 European Championship final tournament, the player's surname was worn above the number on the reverse, in capitalised plain red lettering in the same font as the numbers. The shirts worn by the Neville brothers also included their first initial i.e. G . NEVILLE and P . NEVILLE. 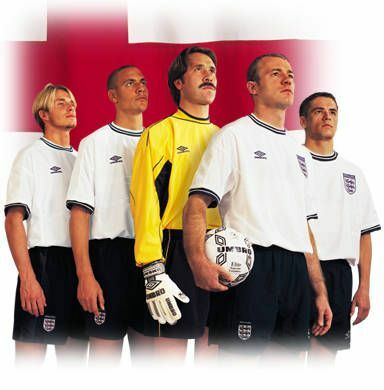 England had logos sewn-on to the upper sleeves for the 2000 European Championship tournament fixtures. The 'Euro 2000' tournament logo was on the right arm and the UEFA Fair Play logo was on the left arm. 34 players appeared in this uniform. 8 players won their first cap in this shirt, including Emile Heskey, who notched up 62 England appearances. 8 players also made their last international appearance in this shirt. Stuart Pearce collected his 78th cap at the end of an illustrious career, whilst Alan Shearer bowed out at Euro 2000, with his 63rd cap. Michael Gray won just three England caps, the first and last of which were in this shirt. Seth Johnson's entire international career of 17 minutes, in Turin, was spent in this shirt. This was the third home shirt in succession that Shearer had been top scorer in. He signed off with a penalty in his last game, which unfortunately saw England's early exit from Euro 2000. It was his 30th for his country. Only Heskey scored his first international goal in this shirt, his first of seven. Apart from Shearer, Keown was the only player to notch his last England goal in the shirt, his second coming in the same game (against Malta) in which Heskey scored his first. Shearer was an ever-present captain throughout Kevin Keegan's time in charge, until his retirement from international football at the end of the 2000 European Championship finals tournament. The three remaining games played in this uniform were each under a different coach. Keegan reinstated Adams as skipper on Shearer's retirement, only for Adams to also retire from international football. Howard Wilkinson took over and selected Keown for his only outing as captain, before Peter Taylor unexpectedly turned to Beckham, for his single game in charge, on the shirt's last outing. Beckham went on to captain his country on 59 occasions. After the excesses of the nineties, England came up trumps with a return to a more traditional style of kit, though all was not as it appeared. The shirt returned to plain white, simple yet attractive, and more akin to a classic sixties style, with discreet navy blue stripes on the collars and cuffs. 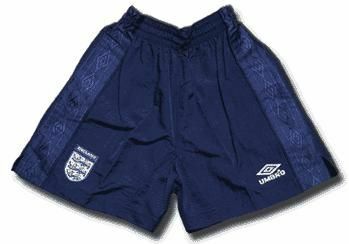 However, Umbro cleverly managed to sneak their own traditional diamond pattern onto both the sleeves and the seams of the shorts. As these were the same colour as the shirts and shorts, they were only visible when up close. If they had been in contrasting colours, there would surely have been outrage amongst England fans. Umbro sensibly dispensed with the large capitalised letters above the three-lions emblem, a practice that had begun with the 1995 home white shirt. The team name, England, which had appeared below the emblem in the middle of recent jerseys--probably to dispel the impression created by the prominence of the manufacturer's name that the shirt was the Umbro team's jersey--was now imprinted on a navy blue strip across the top of the emblem. Since the three-lions emblem was so well known and synonymous with England and since England had done without the team name on their shirts for most of their history, it was a wonder why this embellishment was necessary. There were other changes in the three-lions emblem. It returned to the traditional left side of the shirt. The designers reverted to the traditional navy blue as the colour of the three lions. 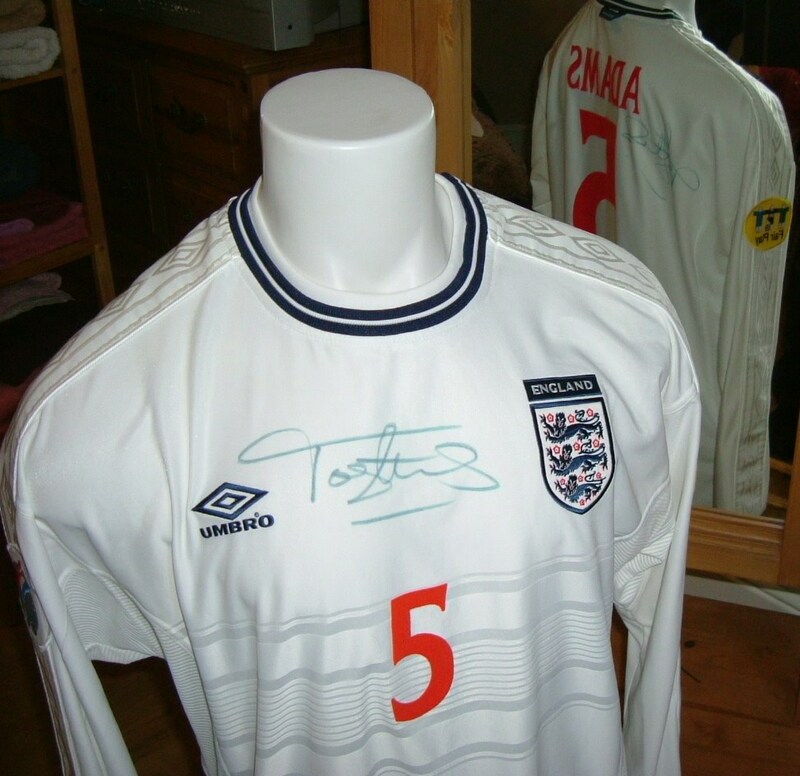 And the white margin surrounding the three lions, a feature which began with the 1993 home white shirt, was omitted in favour of the traditional design, brought back on the instructions of the FA's Executive Director, David Davies. Umbro claimed to have produced a shirt that was as space-age as any produced by NASA over the years, with Microfibre material, not to mention a Vapatech coating on the shirt. Thanks to Kevin Keegan's desire to use the red kit for every colour clash, it was only seen at Wembley on two occasions out of twelve games and it was a desperate period in England's history. Keegan guided them into the European Championship finals tournament, though they needed Sweden's help in beating Poland, so that they could secure a play-off place, where a miserable Wembley performance against Scotland saw them limp over the finishing line with an embarrassing defeat. This was further compounded in the final tournament when England twice threw away winning positions to leave early with their tails between their legs. It took Keegan another four months to fall on his sword. The new millennium had begun in complete disarray for England. Following Keegan's departure, there were two more temporary coaches appointed in Messrs. Wilkinson and Taylor, but it was a further four months before a permanent replacement could be found, by which time the new cycle of an Umbro kit launch every year had begun and would continue until the end of the decade, whereupon the cycle was speeded up.